One of my favourite retro home trends at the moment, would have to be pineapples. Over the last couple of years, I’ve seen loads of fabulous home pieces paying tribute to the good old pineapple ice bucket – the perfect kitsch household accessory. No vintage bar would be complete without one and now these fruity treats are brightening up other gorgeous homeware. I’ve looked online and chosen some of my favourites…. I love the brass and gold tones of the pineapple range at Laura Ashley. I’ve had my eye on the wallpaper for ages and at the moment it’s top of the list for when I redecorate my living room. I also really love the lamp, which would quite like to take home with me as well. 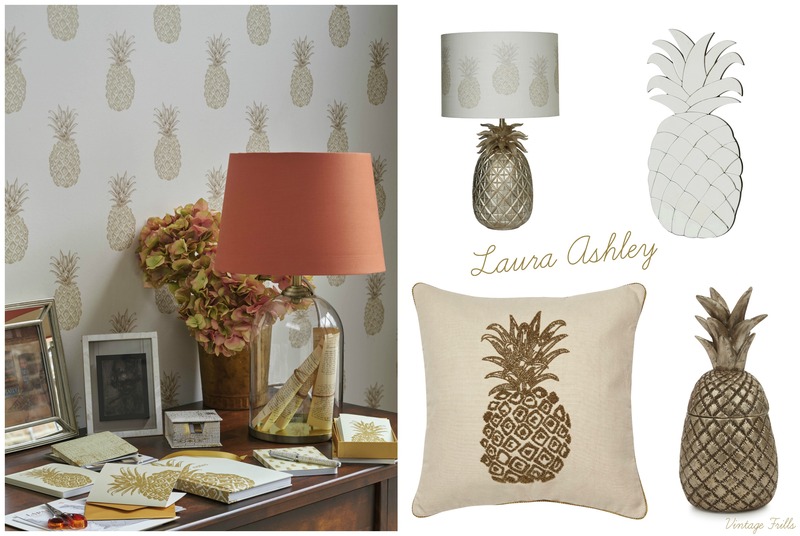 Check out the full pineapple range on the Laura Ashley website. 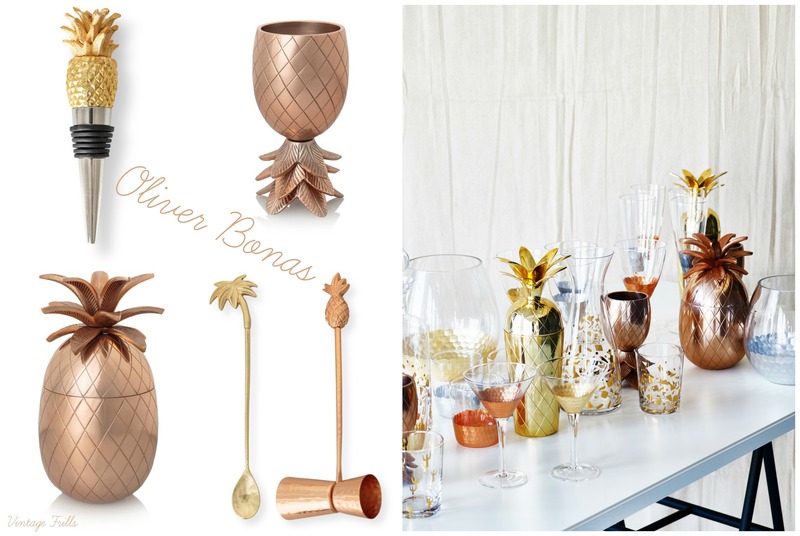 Now we all know I love a cocktail, and I cannot resist the pineapple themed range of cocktail things from Oliver Bonas. I love the mixture of copper, yellow gold and rose gold tones, now I’m writing about cocktails for Vintage Life, I might have to purchase some of this range! See all the gorgeous cocktail goodies on the Oliver Bonas website. 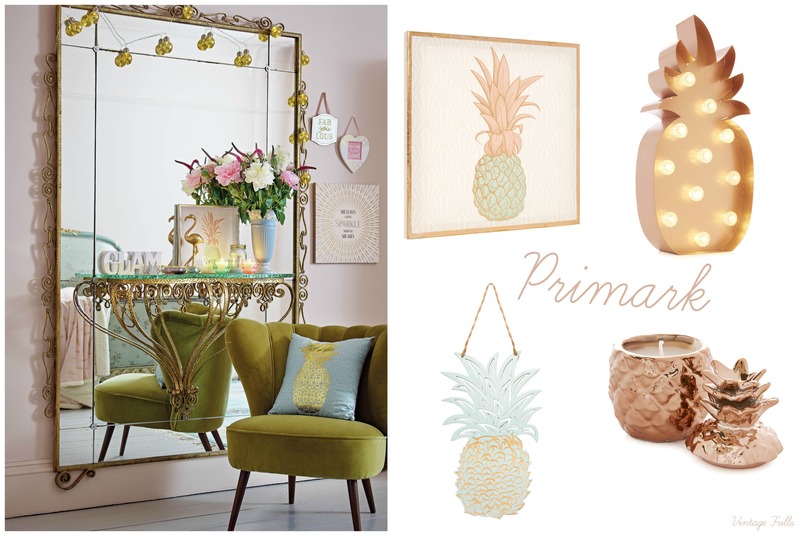 If you read my post on Jessica’s bedroom revamp, you’ll know that I’m loving Primark Home at the moment, they have some lovely affordable pineapple accessories too. These are a bit cuter and less sophisticated than the other brands, but still lovely and perfect if you’re on a budget. Previous Article Too Busy to Blog! Awesome selection! I flip for all things pineapple as well.